Buy-a-Brick and Pave the Way to our new Dogpark! Within the entryway to our dog park, we have set aside a field of bricks that are dedicated to our special companions, those who walk by our side today, as well as those who will always walk with us in memory. We offer both honorary and memorial bricks, so that you can buy a brick in honor of, or in memory of, a ‘best friend’. 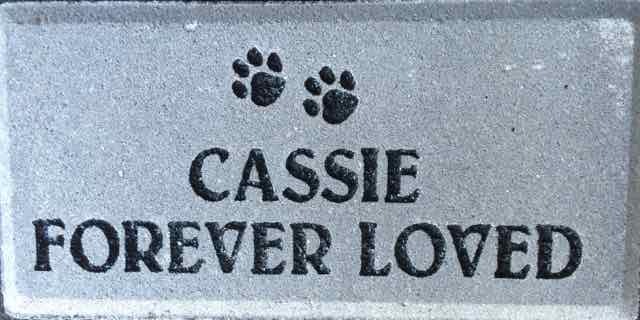 Your brick will be individually inscribed with your dog’s name and your personal message. Each brick is 4”x8”, and can be inscribed with up to 3 lines of text, eighteen characters on each line, completed and installed for $250 per brick. These bricks will be placed within the honorary memorial field. Each brick serves as a lasting reminder of those dogs who have touch our lives.